Chaffee County Sheriff John Spezze sets state Sen. Kerry Donovan straight. State Sen. Kerry Donovan was totally busted for flat-out lying on the Senate floor Friday when she declared Chaffee County Sheriff John Spezze told her he supported the red flag gun confiscation bill. 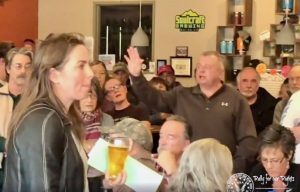 The day after her floor speech, Donovan was confronted by angry constituents and the sheriff at a town hall meeting in a local bar, where the lawmaker got so flustered she had to put down her beer before slapping her hands at the audience like they were a bunch of disobedient dogs. It’s shameful behavior, especially for a state senator. It gets more humiliating for Donovan as the conversation dissolves into a pathetic bar scene with Donovan slurring her words as she repeatedly, and wrongly, tries to remember where it was she’s actually spoken to the sheriff before. Was it a town hall meeting? No. A candidate forum? No. Did they talk about a bill last year? No. Uhm, he’s never, ever, spoken to her about it, the sheriff explained, repeatedly. And just to clarify, the sheriff told Donovan he will be asking county commissioners to declare 2nd Amendment sanctuary status, which she also wrongly assumed in her floor speech Chaffee County had no intention of doing.